The club was founded in 1881 following a meeting in the Cherry Tree Inn and was known as the Broom Hills CC. The first President was Reverend George W Keightley vicar of Great Stambridge church and Vice President Mr. Alfred Mottram Rankin who first allowed the ground to be used for cricket. The first fixture is believed to have been against a side from Leigh and took place on 3rd June 1881 in Leigh on Bentall's Meadow behind where the Grand Hotel now stands. The President played in the first match along with William Rankin the 15 year old son of Alfred. Also playing were two members of the Wiseman family James and George, Oyster Merchants and farmers of Paglesham. The remainder of the team was made up of local people possibly connected with the Rankin family business. Alfred Hunt (tailor), Frank Arthy (solicitors clerk), Alfred Warren, (butcher), Walter Smith (miller's clerk), Henry Groves and Lewis Hammann (both engine fitters) and finally Charles Shelley of the family of thatchers who still trade from Hockley to this day. Early teams also included members of the Whittingham family; namely John who was a smith and wheelwright in North Street and James a blacksmith of Canewdon. John Hedgecock, bootmaker of South Street was the ground captain and notably Phillip Benton, farmer of Great Wakering and noted historian who wrote much of the definitive history of South East Essex was at that first meeting and a member of the club. Early fixtures included Wakering and Southminster. 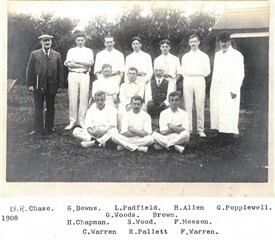 The first known photograph of a Rankin’s team is from 1908 (see above). This team included a number of interesting local characters – the wicketkeeper is Frank Meeson, who farmed at Doggetts, and after whom Meeson’s Mead in Rochford is named. It is believed that the scorer is Inspector Chase who was the senior police officer in the town at the time and the umpire may be F H Brown who was founder of an early bus company in Southend. Len Padfield was the son of the vicar of Hawkwell and went on to win the Military Medal in WWI and Harry Chapman was one of the founders of the Rochford Fire Service (more of him in a later article). The club changed its name to the Rochford Cricket Club at the AGM of February 1886 and continued with that name until after cricket recommenced after WWII in 1946 when it was known as AM & H Rankin Ltd CC. This was name was used in the newspaper reports, but the typesetters quickly tired of such a long name and shortened it to Rankin’s CC and it has stayed that way ever since. This page was added by Brian Pettitt on 13/08/2017.